And so it begins! I personally love reading gift guide posts. Often I get new ideas or I see something amazing that I didn't even know existed. I have plans to do a few differently themed ones this year as per usual. I don't always do the same themes, though I do usually do this one for the host/hostess. A lot of my ideas are the same, but I've linked to newer options. This year, we are hosting the friends and going to my SIL/BIL's house for the family dinner. So I've got a mix this year! Of course, the list of what to do and get done has grown to an unrealistic length. As a perfectionist, it's incredibly difficult to not put a lot of pressure on myself to get everything perfect for when our friends come. I know it is not realistic, but I am who I am. Any other perfectionists out there? May we all be a little easier on ourselves and remember that in the long run it doesn't matter nearly as much as our brain tells us it does. 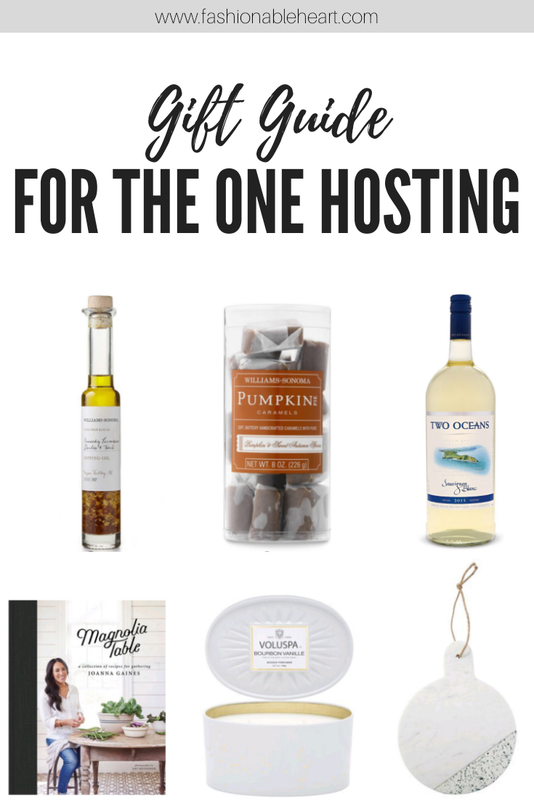 Here are some of my favorite ideas for what to bring to the one hosting! Will you be hosting, traveling, or doing your own thing this year? I've done them all and love them all for very different reasons. Flavored Dipping Oil (via Williams-Sonoma, $24.95 CA) - Is your host a bread lover or foodie? These are a perfect fit and might can even be put to use at dinner that night, because what holiday feast is complete without bread?! Edible Treats (via Williams-Sonoma, call store for pricing) - Again, perfect for the foodies. Maybe bring a basket of treats, something they can use in baking, and just a little something they can enjoy when everyone leaves. Wine (via Two Oceans (via Two Oceans, $10.95-18.95 CA) - For the party or after for the host to unwind. Find one of those cute wine gift bags and you have a gift that anyone can enjoy. Because if they don't drink it, they can cook with it...which is where most of my wine goes. Cookbook or Coffee Table Book (via Chapters, $36.99 CA) - I just think that you can't go wrong with a pretty cookbook, coffee table book, or hobby book. Home Scents (via Chapters, $25 CA) - Candles, diffusers, you name it. An item that makes your house smell good never goes out of style and is never not an useful gift. Cheese or Cutting Board (via Chapters, $34.50 CA) - I am a firm believer of having multiple boards around. So many uses!